Centered at 19.335°N, 155.209°W, about the quake struck about 11km (7mi) SSE of Volcano, Hawaii at a depth of 8.6 km (5.3 mi), reported USGS/EHP. At least one aftershock measuring 3.1Mw was reported, as of posting. At least 8 more earthquake measuring 4.0Mw or greater have occurred near Bardarbunga volcano in Iceland since Friday. 4 of the quakes measured 5.0Mw or greater, including three shocks that registered 5.2Mw, according to the data provided by the Icelandic Met Office (IMO). Warning: Fissure eruption continues in Holuhraun lava field, north of Vatnajökull (Vatna Glacier). Warning: Today (Sunday) volcanic gas emissions are expected to drift east and later to the northeast of the eruption site. Tomorrow (Monday) the pollution will affect areas to the north and northwest. 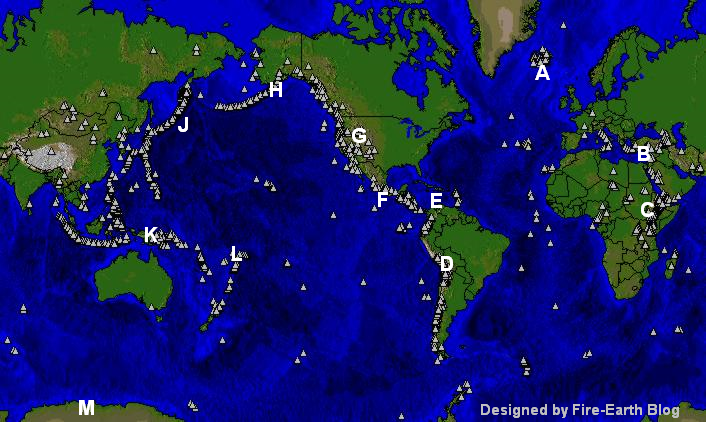 For detailed earthquake forecasts tune into FIRE-EARTH Reports daily @ 06:32UTC. Hawai‘i County Mayor has signed a state of emergency proclamation due to the advancing lava flow in the Wao Kele O Puna area after the flow extended to less than 1.5km from the edge of the Ka‘ohe Homesteads subdivision, said the mayor’s office. It’s believed that at least 8,211 people (based on 2010 Census) residing in the subdivision of Hawaiian Beaches are directly threatened by the lava flow. However, the number is unrepresentative of the present population since the District of Puna is the fastest growing population in the State, said the Mayor’s Proclamation. “We are taking this step to ensure our residents have time to prepare their families, their pets, and their livestock for a safe and orderly evacuation from Ka‘ohe in the event the flow continues to advance,” said Mayor Kenoi. No evacuation orders have yet been issued, said Hawaii County Civil Defense; however, the risk of lava flow affecting the subdivision is increasing daily. Volcanic Activity Summary: On June 27, 2014, new vents opened on the northeast flank of the Pu‘u ‘O‘o cone that fed a narrow lava flow to the east-northeast. On August 18, the flow entered a ground crack, traveled underground for several days, then resurfaced to form a small lava pad. The sequence was repeated twice more over the following days with lava entering other cracks and reappearing farther downslope. In this way, the flow had advanced approximately 13.2 km (8.2 miles) from the vent, or to within 1.3 km (0.8 miles) of the eastern boundary of the Wao Kele o Puna Forest Reserve, by the afternoon of September 3. Overnight, lava did not appear to advance farther east within the crack system, but surface flows advanced about 100 m to the northeast. At the average rate of advancement of 250 m/day (820 ft/day) since July 10, we project that lava could reach the Kaohe Homesteads boundary within 5-7 days should lava resume advancing within the crack system. [Volcanic cloud height] SO2, low ash emissions continue from Kīlauea caldera, TFR in place. [Lava flow/dome] June 27th Lava Flow continues to advance. [Lava flow/dome] Lava Flow from Pu‘u ‘Ō‘ō vent could advance to Kaohe Homesteads within a week. Remarks: The Pu‘u ‘Ō‘ō vent in the East Rift Zone of Kīlauea Volcano began erupting on January 3, 1983, and has continued erupting for more than 31 years, with the majority of lava flows advancing to the south. Over the past two years, lava flows have issued from the vent toward the northeast. The June 27th flow is the most recent of these flows and the first to threaten a residential area since 2010-2011. The surface flows at the front of the June 27th lava flow are fed by lava that is supplied through a lava tube that originates at the vent on Puʻu ʻŌʻō. This thermal image shows the lava tube close to Puʻu ʻŌʻō. Although the lava is several meters (yards) beneath the surface, it heats the surface sufficiently to be easily detected with thermal cameras. Iceland has once again raised its aviation warning to the highest level after a new fissure eruption in Holuhraun lava field near Bardarbunga volcano. Volcanologists monitoring restive Bardarbunga observed a fissure eruption at 05:15GMT on Sunday, said IMO. 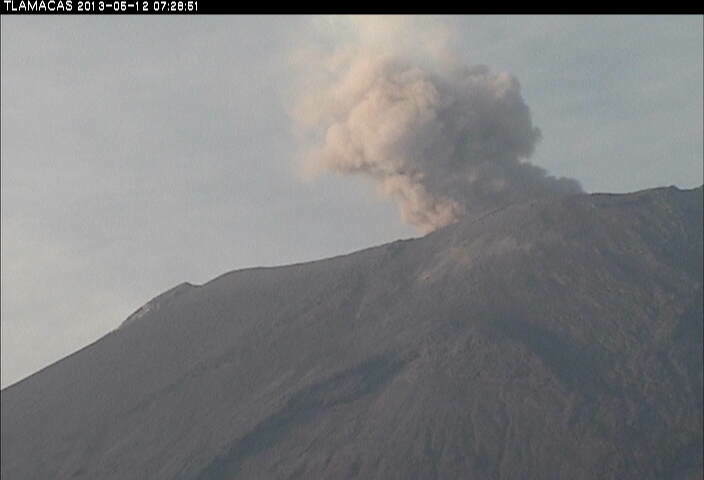 Currently, only lava is erupting, but no ash has been observed, added IMO. The eruption prompted IMO to raise the aviation warning code to ‘red’ for the large area that houses the Bardarbunga volcanic system. The new fissure is located very close to the Friday’s, with the fracture extending further to the north, said a researcher. The latest eruption is said to be far more more intense than Friday’s, with the lava flow estimated to be more than 10 times greater. An estimated 500 million cubic meters of lava has flowed from beneath the volcano in a long dyke since last week. Sakurajima’s eruption on Friday was the most powerful one at the volcano since last month when the volcano spewed large columns of ash with rivers of lava flowing in the direction of nearby Ibusiki City. Ash clouds from Mt. Sakurajima explosion reached a height of 4,500 meters, the second-highest since 1955. A record of 5,000 meters was set in 2013. Ash fall was reported late Friday evening in areas southeast of the volcano. One of the most active volcanoes in the world, Sakurajima is located in Kagoshima Bay, southern Kyushu, Japan (about 1,100km WSW of Tokyo). The composite volcano has three peaks: Kitadake, Nakadake and Minamidake (southern peak). 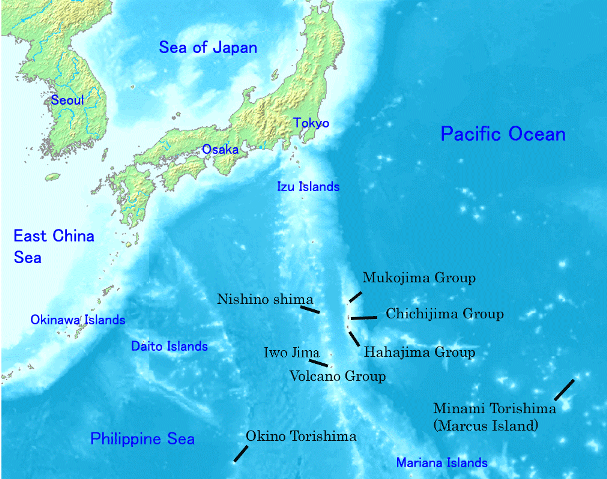 Since 1955 the Minamidake crater has been continually active. 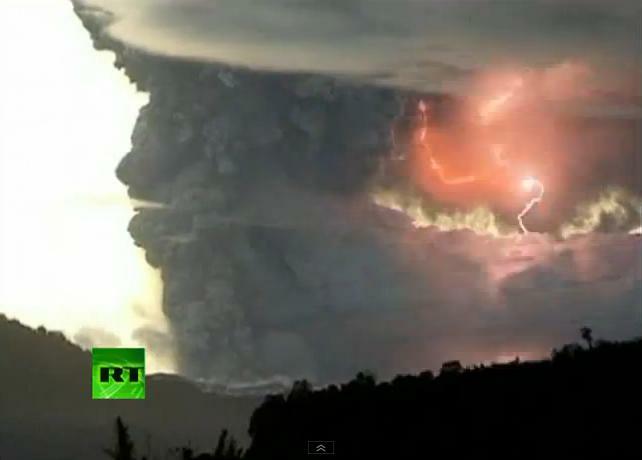 The ongoing activity includes strong strombolian to ash explosions at least once and as many as 8 times a day. The volcano was placed under a Level 3 (orange) alert by the Japan Meteorological Agency on March 21, 2012. Level 3 (orange) alert means the volcano is active (do not approach crater). A major lava flow in 1914 connected the volcano island to the Osumi Peninsula on the Kyushu Island. Plume of smoke and ash reached as high as 7,500 meters on Tuesday; however, seismic activity has decreased over the past 12 hours to much lower levels than that of Monday, Alaska Volcano Observatory (AVO) reported. Ongoing pyroclastic and lahar activity have created hazardous conditions on the north flank and north side drainages heading on the volcano, said AVO, adding that large, more ash-rich plumes could develop with little or no warning. Santa María volcano (volcán Santiaguito) is a large active volcano located in the Western Highlands of Guatemala, near he city of Quetzaltenango. The volcano has been eruting since May 9, 2014, forcing the authorities to evacuate hundreds of people. The volcanic ash from the eruption was detected as far away as San Francisco, more than 4,000 km away. Sakurajima’s eruption on Sunday was the most powerful one at the volcano so far this year. The explosion ejected a column of ash and smoke to a height of about 4.5km above the Minamidake crater, according to local reports. There were no immediate report of damage or casualties, as of posting. 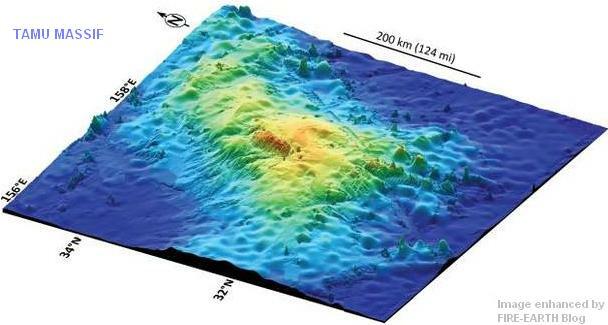 Researchers have discovered an immense shield volcano on the seabed, northwest Pacific Ocean. Tamu Massif is said to be the oldest and largest edifice of the Shatsky Rise oceanic plateau in the northwestern Pacific Ocean. A single, immense volcano, Tamu Massif is constructed from massive lava flows that erupted from the center of volcano to form a broad, shield-like dome some 145 million years ago. Researchers writing in the journal Nature Geoscience suggest the 310,000 km² (119,000 mi²) Tamu Massif could be the largest single volcano on Earth, comparable in size only to the Olympus Mons on Mars, believed to be the largest volcano in the Solar System. Rising 3.5km above the seabed, Massif lies about 2km below the sea, and is rooted more than 30 km into the earth’s crust on the Shatsky Rise, some 1,600 km east of Japan. “We don’t have the data to see inside them and know their structure, but it would not surprise me to find out that there are more like Tamu out there,” said Dr Sager, one of the researchers at the University of Houston. “One interesting angle is that there were lots of oceanic plateaus (that) erupted during the Cretaceous Period (145-65 million years ago) but we don’t see them since. Scientists would like to know why.” Sager said. 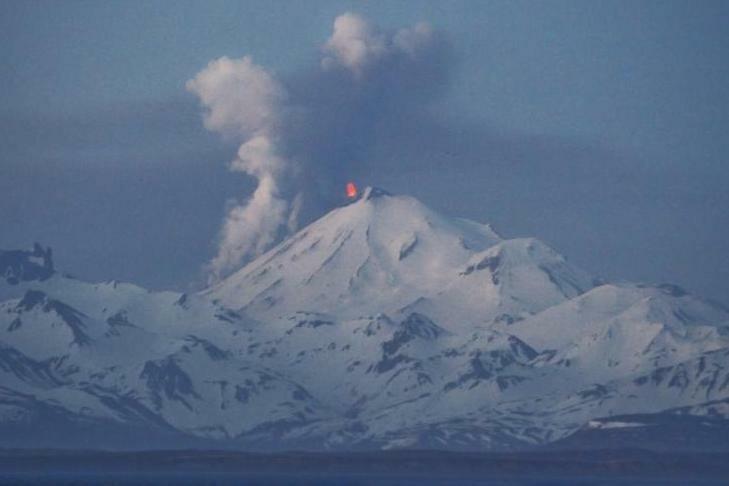 Pavlof Volcano, the second Volcano in the Aleutians to become active, began erupting on Monday and was still spewing clouds of ash and steam on Wednesday, the Alaska Volcano Observatory (AVO) said. The volcano has been emitting intermittent dark clouds of ash and steam rising up to 20,000 feet a.s.l. and drifting in a northeasterly direction, the observatory said. Mt Cleveland, the other currently active Alaskan volcano, has been erupting intermittently since 2011. Volcanic ash from Pavlof and other Alaska volcanoes could pose a threat to air traffic in the region. Elevated surface temperatures continued at Cleveland Volcano over the past 24 hours. No explosions have been detected by regional infrasound data. There has been no further information about the lava flow. AVO will continue to monitor these volcanoes and issue additional information as available. ORANGE Volcano is exhibiting heightened or escalating unrest with increased potential of eruption, timeframe uncertain, OR eruption is underway with no or minor volcanic-ash emissions [ash-plume height specified, if possible]. 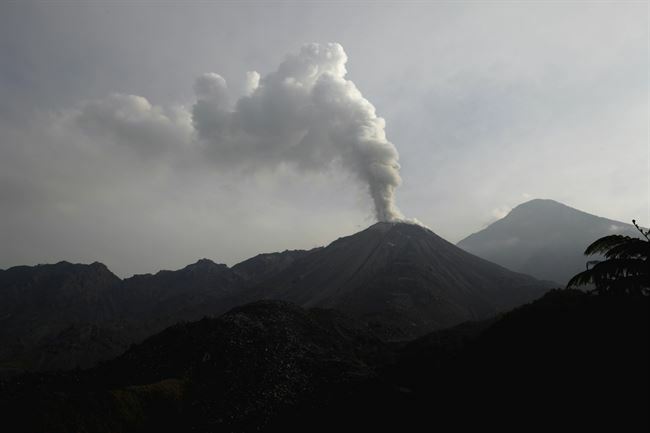 Mexcio’c National Center for Disaster Prevention (CENAPRED), has raised the volcanic activity alert to Yellow Phase 3 from Yellow Phase 2 on Sunday, after detecting increased level of explosive activity at the towering volcano. Yellow Phase 3 alert means the volcano could explode ejecting lava and other volcanic matter over considerable distances, according to CENAPRED chart. The 5,452-m Volcán Popocatépetl, or “smoking mountain” in Aztec, North America’s 2nd-highest volcano, sits about 70 km SE of Mexico City. Mount Etna, Europe’s highest volcano, erupted spectacularly shooting a fountain of fire into the air. Italy’s highest and most voluminous volcano, Mt Etna stands 3,333 tall overlooking Catania, Sicily’s second largest city. Repeated eruptive episodes at Etna, including intermittent emissions of small quantities of ash have been observed from both the New Southeast Crater (NSEC) and Bocca Nuova Crater since February 2, 2013, GVP cited Italy’s National Institute of Geophysics and Volcanology. North Sulawesi’s Soputan volcano erupted on Sunday at about 6:00 am local time, ejecting a column of volcanic gases about 6km into the air. However, no evacuation order was issued as the volcano did not pose an immediate danger, officials said. “They nearest residents live some eight kilometers from the mountain and so evacuation is not yet necessary [since the current evacuation zone was set at a 6km radius around the volcano, a forested area that is uninhabited,]” spokesman of the National Disaster Mitigation Agency (BNPB) said. 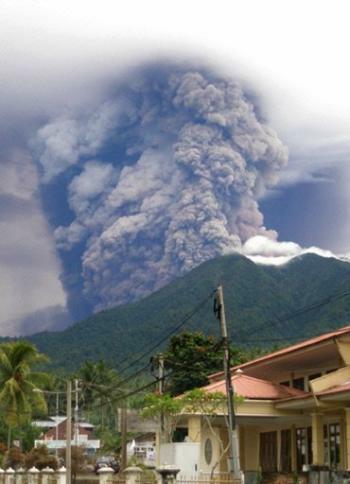 “Last night, at around 11 pm, the mountain entered its eruption phase,” he said. Mt Soputan is located about 2,160 km (1,340 miles) northeast of Indonesian capital Jakarta. The volcano had previously erupted in 2008. Soputan volcano spews thick smoke and heat clouds in Minahasa on October 7, 2008. Source: AFP. Image may be subject to copyright. 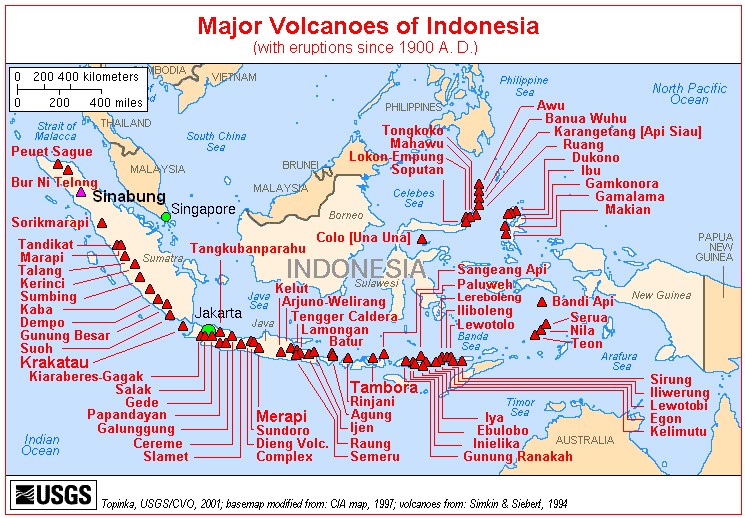 Indonesia, which sits on the Pacific Ring of Fire, is home to 150 listed volcanoes, some 109 to 130 of which are regarded as active, according to various sources. Soputan on a restful day! The small Soputan stratovolcano, seen here from the west, was constructed on the southern rim of the Quaternary Tondano caldera in northern Sulawesi Island. The youthful, largely unvegetated Soputan volcano is one of Sulawesi’s most active volcanoes. 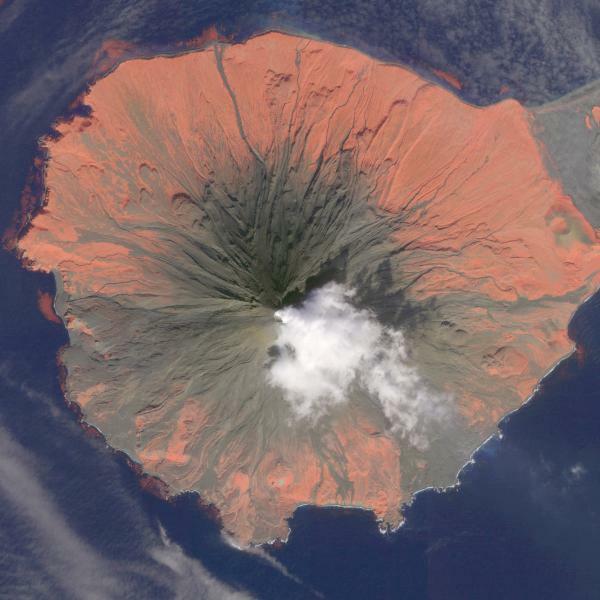 During historical time the locus of eruptions has included both the summit crater and Aeseput, a prominent NE flank vent that formed in 1906 and was the source of intermittent major lava flows until 1924. Photo (undated) by Agus Solihin (Volcanological Survey of Indonesia). Image and caption: GVP. 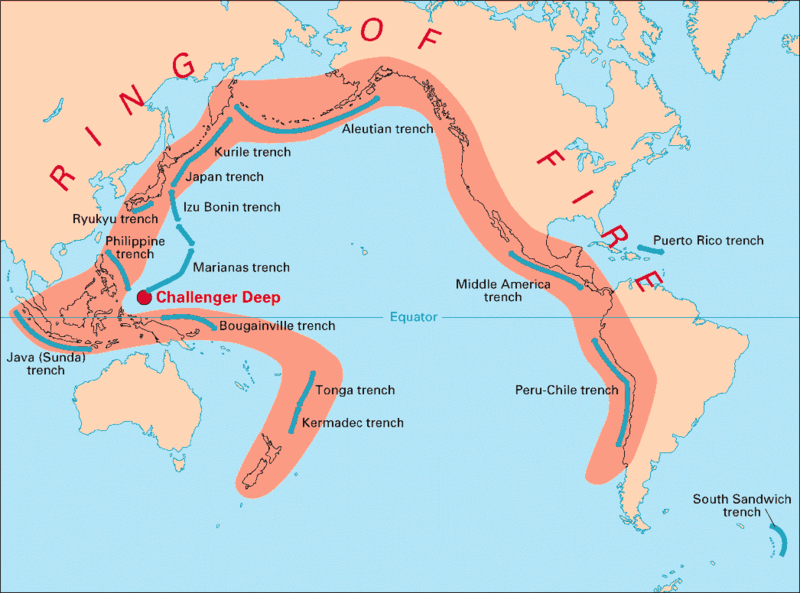 The Pacific Ring of Fire is an area of frequent siesmic activity and volcanic eruptions caused by plate tectonic movements. Encircling the basin of the Pacific Ocean, which contains oceanic trenches, volcanic arcs, and volcanic belts, the 40,000 km Ring of Fire is home to 452 volcanoes. About ninety percent of the world’s earthquakes including 80% of the world’s major earthquakes occur along the Pacific Ring of Fire. According to the advisory the eruptions are ongoing, with ash clouds moving in easterly direction. 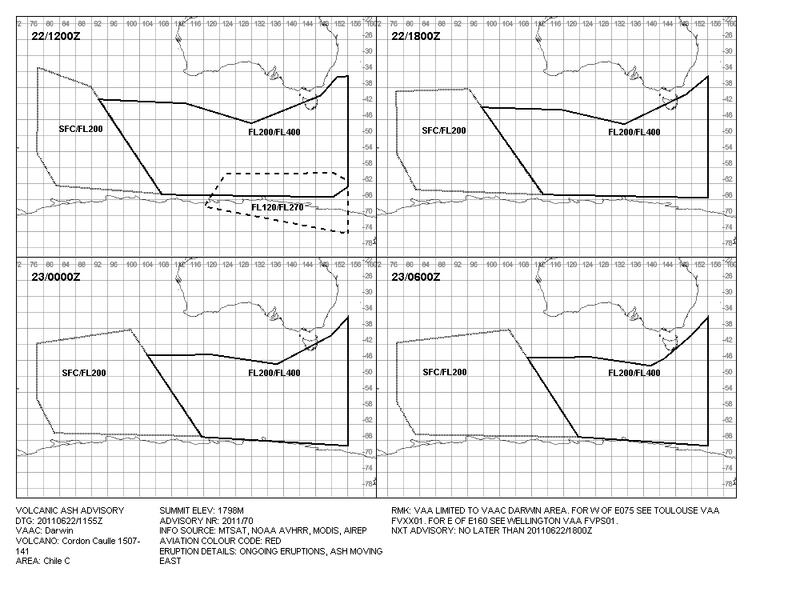 Puyehue-Cordón Caulle Volcanic Ash – Surface to FL200 Chart. VA CLOUD AREA CAN BE IDENTIFIED IN MULTISPECTRAL SATELLITE IMAGERY – AREA OF RESIDUAL LOW LEVEL ASH CLD MVG TO N AND NW 10/15KT FROM EARLIER ERUPTION. Ash and sulphur dioxide (SO2) from Puyehue Volcano Complex eruptions. The Ash RGB is composed from data from a combination of the SEVIRI IR8.7, IR10.8 and IR12.0 channels. 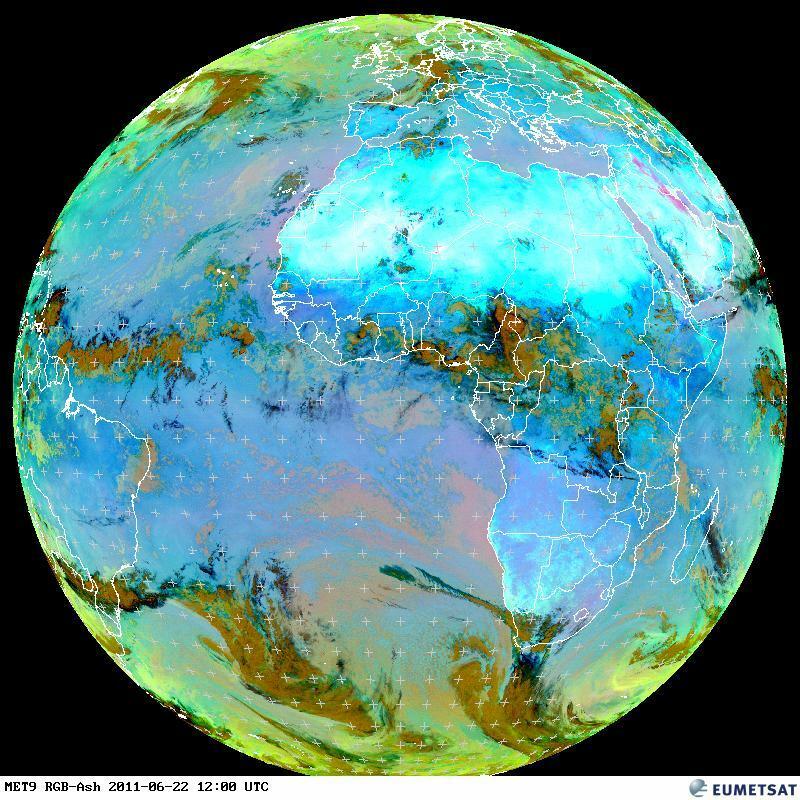 Copyright Eumetsat 2011. Click image to enlarge. Source: USGS-EHP. Map enhanced by FIRE-EARTH. NO warning, watch or advisory currently in place, PTWC said. 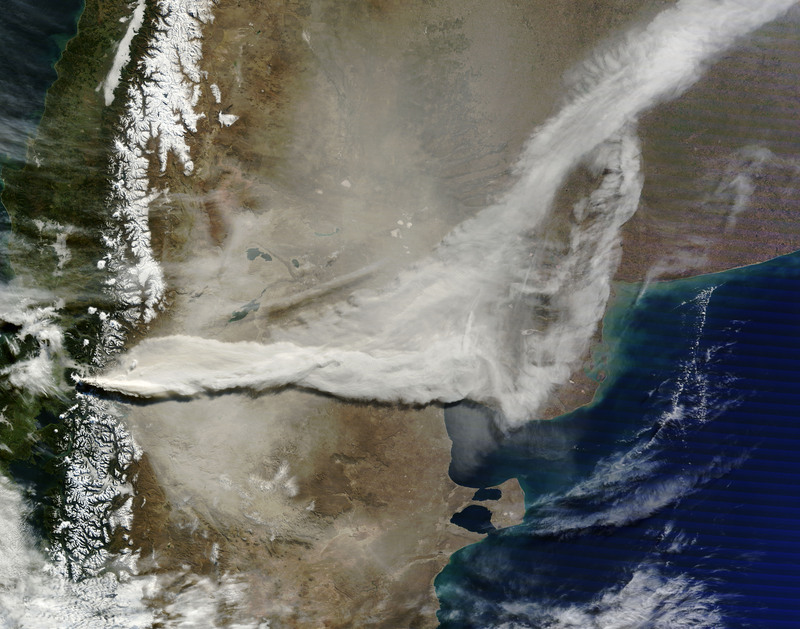 The ash clouds have severely affected airline operations in South America. Among the hardest hit airlines are Chile’s LAN and Brazil’s TAM and Gol, media reported. “There are no signs that the situation is going to change or stabilize in the short term,” said director of Chile’s national service of geology and mining (SERNAGEOMIN). 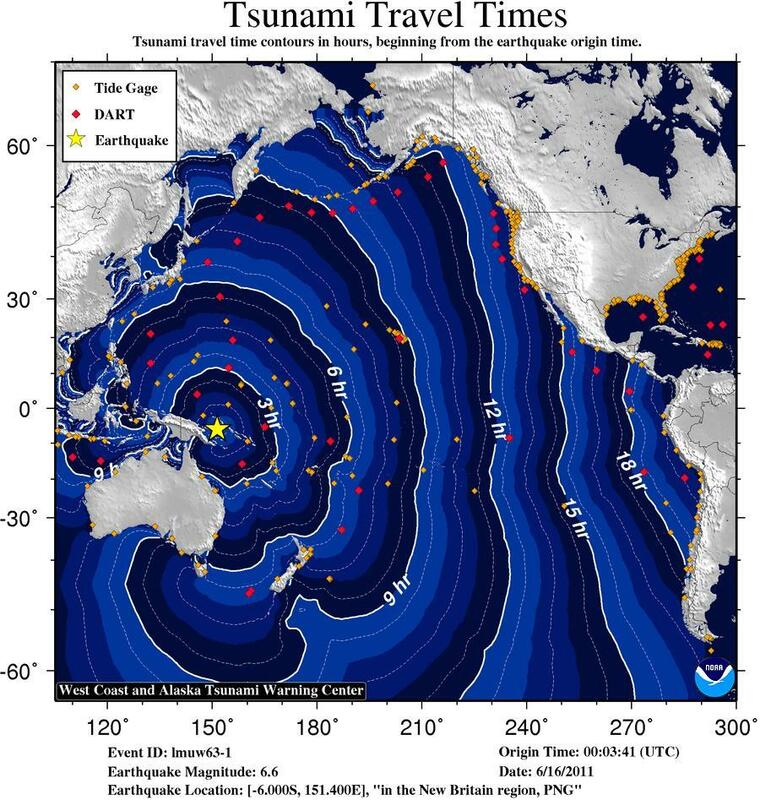 … there’s a strong probability that the quakes may have primed one or more regional volcanoes for eruption. Nabro Volcano erupted around midnight Sunday local time, ejecting a 15-km plume of ash into the air, reports said. The volcano, which is located about 375 km southeast of the Eritrean capital Asmara, sits within the Afar Triangle, a tectonic triple junction. Nabro volcano, Eritrea, sits close to the border with Ethiopia. Credit: ESA/NASA. Click image to enlarge. Nabro (top) and Mallahle (bottom) volcanic calderas. This false-color topographical image of the two volcanoes was produced by NASA. Click image to enlarge. A map showing the approximate location of Nabro and Dubbi Volcanoes. The yellow circles mark the epicenters of the recent quakes that struck the area. Red stars are the two largest shocks in the swarm measuring 5.7Mw. Click image to enlarge. 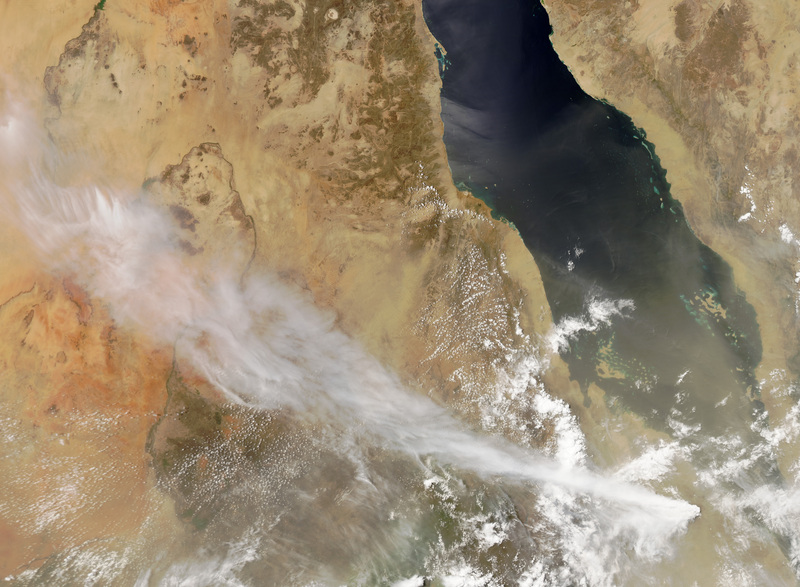 The huge ash cloud ejected by the volcano is said to be moving across the Horn of Africa, threatening air travel. The German airline Lufthansa said on Monday it had cancelled two flights, one a flight out of the Eritrean capital Asmara, and the other into Addis Ababa. The ash plume also forced the U.S. Secretary of State Hillary Clinton to curtail her visit to the region. Ironically, Obama was forced to abandon his visit to Ireland when Iceland’s Grímsvötn volcano erupted last month. Chilean officials expand the evacuation zone around a volcanic complex as it continues to eject thousands of tons of ash each hour. The national emergencies office (ONEMI) fears that volcanic ash and pumice could clog up rivers and waterways causing flooding, or trigger lahars, as rain hits the area. The rain is expected to continue for at least several days. “The forecast is for more rain on Tuesday, Wednesday and Thursday,” an ONEMI official told a local news agency. Frame grab from a video clip taken June 6, 2011. Click HERE for the video link. Click animation link to view the transport of the plume from 1:45 pm local time June 4, 2011, until 10:45 am June 6, 2011. The volcanic tremors have dropped significantly, Chile’s National Emergency Office of was reported as saying. The tremors had averaged 240 per hour during the first 12 hours, but dropped to about 17 an hour on Sunday. Carlos de Bariloche, Argentina. Utility workers use bulldozers to remove large amounts of volcanic ash from Puyehue eruption carried across the Andes easterly winds and dumped on their city. Photo: Alfredo Leiva/Associated Press. Image may be subject to copyright. Nearby residents are said to be extremely worried about the welfare of their cattle and other farm animals. “Ash was dumped like a snowstorm. 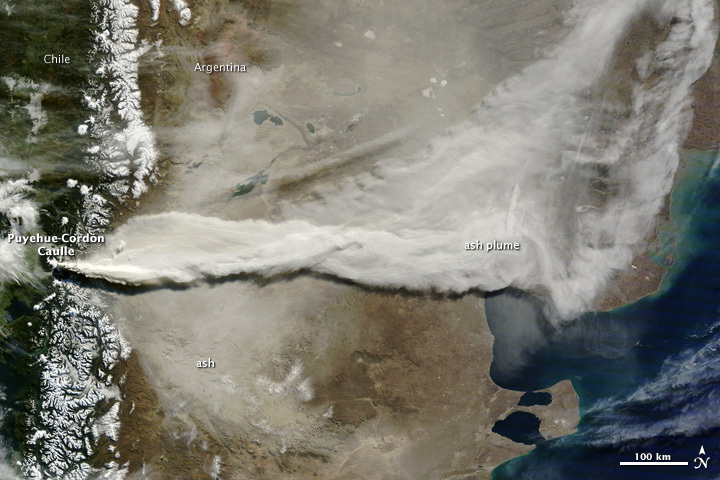 The city is covered in gray ash,” a Bariloche official, told Chile’s national TV. Bariloche airport remains closed, and Aerolineas Argentinas flights to the area are cancelled. Meanwhile, officials in the small Argentine Andean town of La Angostura announced that the town of 16,000 people was on “red alert,” urging the residents to stay at home and conserve water, a report said.